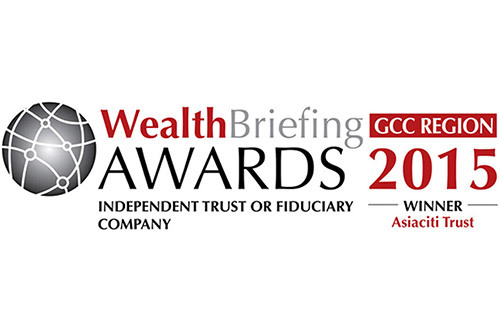 Asiaciti Trust Group, one of the UAE’s foremost trust companies has been crowned the ‘Best Independent Trust or Fiduciary Company’ at the WealthBriefing GCC Region Awards 2015, which was held at the prestigious Mina A’Salam on 10 November 2015. Asiaciti Trust Group is one of four firms to be shortlisted in the Independent Trust or Fiduciary category. Showcasing ‘best of breed’ providers in the global private banking, wealth management and trusted advisor communities, the awards were designed to recognise companies, teams and individuals which the prestigious panel of judges deemed to have ‘demonstrated innovation and excellence during 2015’. Commenting on the firm’s success, Laurence Black, Regional Director, Business Development MENA, Asiaciti Trust Dubai, said: “We are delighted to have been voted the winner of this prestigious award by so many of the industry’s great and good. It is a great honour to be recognised in these awards, and testament to the hard work that the team have put in over the last 12 months. Everyone has really pulled together to ensure we continue to deliver the highest level of service to our clients, and move us that bit closer to our goal of being recognised as a leader in the MENA wealth structuring space”.